Hitting the water for a day of fishing is something just about every angler looks forward to but if safety precautions aren’t taken into consideration a day out on the water can turn tragic in the blink of an eye. Countless things can happen while out on the water and you need to be ready with a fishing life vest in case of an accidental fall overboard. Things happen, you lean to far over while landing a fish, you venture to far off shore and accidentally flip you fishing kayak or you simply get blindsided by a wave. If you’re in the water and don’t have the ability to get yourself back aboard your fishing kayak or inflatable fishing boat, you could find yourself in serious trouble. Having to tread water for an extended period of time can be very taxing on the body and oftentimes can lead to over exhaustion and drowning. This is why it is imperative that you use a fishing life jacket every time you go out onto the water for a day of fishing. 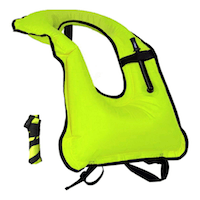 Depending on your size and weight you’ll need to make sure you get a life vest that can accommodate your size and provide ample flotation if need be. If you’re on the market for a fishing life vest, looking for a comfortable life jacket or trying to find the best life jacket for fishing, you’ve come to the right place. Here are our picks for the best fishing life vests for the money in 2019. The Onyx MoveVent life jacket conforms to your body like a glove, while it’s innovative vented channels help to keep you cool while you are paddling. It offers excellent mobility and accommodates all levels of paddling. The soft, lightweight flotation foam is covered with SOLAS grade reflective material to ensure that you are visible at all times. The covering is 200 denier nylon with anti-rip technology. It also features an expandable zippered pocket with mesh drainage and a lash tab for small accessories. On the back of this life vest there is a drying loop. There is also an attached safety whistle should you get into trouble on the water. It has a strong, durable zipper closure and adjustable side belts to conform to your body, which is aided by shoulder adjustments with neoprene comfort pads. The design of the jacket comprises mesh that helps sculpt it to the body and stay in place and suitable for high back seats and atop kayaks. The arm holes on this vest are quite big so may be uncomfortable for some. However, due to the mesh at the back, this vest isn’t bulky unlike some other brands and it doesn’t force you forward while sitting. You forget that you are even wearing a vest easily making it one of the best life jackets. The back could be higher, however, if you have a kayak with a particularly high back seat, it will push this life vest up. 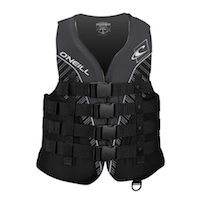 The O’Neill Men’s Superlite Life vest is a USCG approved personal flotation device. It is perfect for use in fishing, tubing, and boating. It has very minimal bulk which allows for full mobility and ensures you are not restricted while wearing it to the extent that you’ll even forget that you have it on. The coated polyester shell is very durable and creates a strong exterior that can withstand heavy use and be unlikely to rip or tear. Another great thing about this jacket is how quickly it dries in contrast to others that remain wet for a very long time after they have been introduced to the water; the O’Neills dries quickly which prevents them from starting to smell after use. The lightweight polyethylene foam is soft and comfortable and the design of these jackets make them suited to a wide variety of body types with a relaxed fit. They do tend to run small so that is something to keep in mind when deciding what size is best for you to buy, its one of the best life jackets for adults. It also doesn’t come with a safety whistle, though this is something that you can add on. The Lesberg snorkelling vest provides a large buoyancy from 80 to 220lbs while snorkelling. It is fluorescent and provides excellent visibility in the water. The time it takes to both inflate and deflate is very fast and supports the body when snorkelling. It is just right when fully inflated without the need for excess air and has a convenient mouthpiece location. It is very easy to put on and take off due to its horse collar style which can simply be placed over the neck. It fits most adults well. To secure, this vest has waist and crotch straps. These are latch straps that secure vertically and horizontally with easy pinch buckles for fast removal. The crotch strap does have a tendency to ride up, which can be very uncomfortable so make sure that it is secured correctly but not too tightly, this is an amazingly lightweight and thin life vest. One great thing about this vest is how lightweight and compact it is. Easy to pack up once deflated, it comes with a mesh bag for convenient storage. As these are designed specifically for snorkelling, they are not as good as some other flotation devices if you are planning on using one while kayaking. The Stearns Classic vest is US Coast guard approved PFD and is designed with three adjustable chest belts that help to keep you comfortable when wearing it. This vest has webbed one inch straps as well as a durable nylon shell with PE foam on the inside. It is rip resistant and so you will be able to get great, long lasting wear out of this vest. This all-purpose vest is perfect for boating, tubing or swimming. The foam is durable Crostech flotation foam that will keep you up and out of the water should you get into trouble. It has an open sided design with three adjustable buckles to give you breathability. It is designed for adults weighing 90 pounds or more and fits a chest size of 30-52 inches. Due to the open sides, some may find that it doesn’t fit them properly even with the straps and that it is still able to lift up and over their head after being secured. It is shorter at the back so it won’t sit up when you are in the boat and won’t push you forward. A lot of the time these vests are a loose fit. The US Coast Guard approved Type II Life Vest is designed for inland water near the shore, where chances of immediate rescue is likely. It is constructed of heavy-duty nylon, and brightly colored orange fabric for better visibility on the water. The vest is lightweight and easy to store, and has minimal bulk for improved comfort. The product is designed specifically to provide minimum buoyancy and will turn most unconscious persons face up in calm water situations. The adult universal keyhole fits adults who weigh 90 lbs and over (30 – 52 inch chest). The Onyx Universal Live Jacket is a basic floatation device for any boating enthusiast. It has been designed specifically to provide minimum buoyancy and to provide safety while on the water. 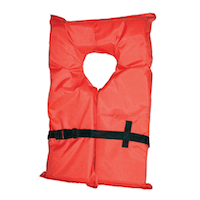 The classic-look life vest is US Coast guard approved and provides a minimum of 15.5lb of buoyancy. Made of durable nylon fabric, it has an adjustable belt for a secure fit. It is also super lightweight, with minimal bulk for extra comfort, and easy to store on your boat to ensure that you comply with all safety regulations.